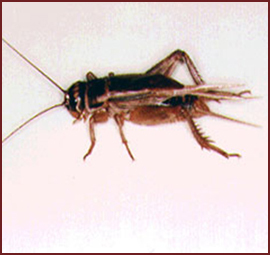 Crickets, are insects related to grasshoppers. They have somewhat flattened bodies and long antennae. There are about 900 species of crickets. They tend to be nocturnal and are often confused with grasshoppers because they have a similar body structure. 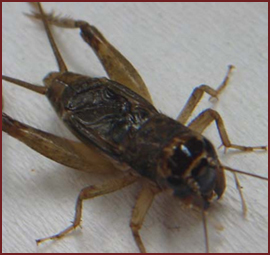 Crickets are known to carry a large number of diseases, most of which cause painful sores but are not fatal to humans. Disease can be spread through their feces, bite, or other physical contact. The left forewing of the male has a thick rib (a modified vein) which bears 50 to 300 ridges. The chirp (which only male crickets can do) is generated by raising the left hind leg and rubbing it against the edge of the right hind leg. This sound producing action is called stridulation and the song is species-specific. • Keep all areas in and around buildings free of moisture, dense vegetation and brush. • Remove debris, trash, rocks, etc. • Make sure that all windows and doors are tight-fitting with proper screening in place. • Place trash, dumpsters, firewood, etc. as far from the house/building structure as possible. 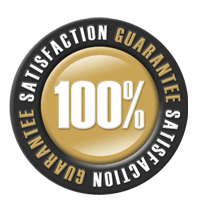 • Seal all cracks and openings around windows, doorframes, attics, eaves, vents and overhangs.